Here's a gift idea for the techie who already has everything: Sengled Pulse, a smart bulb that combines the energy efficiency of a dimmable LED light with the high-quality audio of a JBL Bluetooth speaker. Just screw the Pulse bulb into any standard light socket and pair them up with the companion Android or iOS app. You'll find the Sengled Pulse app on the Google Play store or the iOS store. Once Pulse is paired to your device, you can adjust both the lighting and sound from the app. It's that simple. There are no speaker wires, power cords or remote controls to deal with and you can have up to 8 bulbs working in unison with each other up to 100 ft apart. The LED light part of Pulse has a brightness of 600 lumens which works out to being equal to a 40 to 60 watt standard light bulb. The light bulb uses only 15 watts of power (with a peak of 30) when both the light and speaker are being used. The dimmer is only accessible when using the Sengled Pulse app, and the bulb cannot be connected to external dimmers. The speaker inside the Pulse bulb is powered by JBL, a leader in speaker technology. The speaker provides 13 Watts @ 8ohms; 100Hz-20kHz frequency response, which gives Sengled Pulse a beautiful depth and surround sound effect. The sound can be controlled without the app, since the light connects to your phone just like any other Bluetooth speaker. But when using the app you can pair lights/speakers together to create left/right stereo or mono sound. 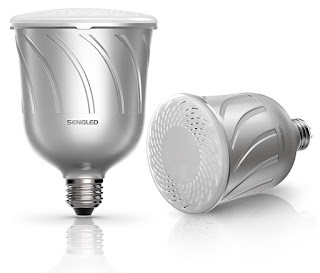 For me, the Sengled Pulse bulbs bulbs are amazing. At about $170, they are a bit on the pricey side. And they're a little too bulky to be used inside a ceiling fan socket without removing the fan's decorative flair. I installed these the recessed lighting in my kitchen/dining area, which makes it perfect for listening to music while eating or having a dinner party. And, that made me think. I wish you could group the lights by room. So rather than control ALL lights, or ONE light, I could control the "Living Room" and "Dining Room". I also wish Sengled Pulse was compatible with my Wink hub. Overall, though the Sengled Pulse is a solid performer, and while it's not a high end home theater sound, the sound is good enough that I can't tell the difference between the low resolution free Pandora audio vs a higher bit rate MP3 from my Google Play library. You can purchase a Sengled Pulse set (One master bulb and one companion) off of Amazon.com for $149.99.